Every workplace has a first aider, someone who can be called upon by staff when it comes to physical injuries, no-matter how small. Now, as we continue our campaign tackling stigma, as part of our #SpeakYourMind campaign, the YEP is highlighting the importance of having support for mental health in the workplace. First aid: Instructor Tara Powell leads the course, left, and Ellie Walton (centre) takes part with the group of attendees at the YEP's offices. We yesterday hosted a free mental health first aid course, led by accredited instructor Tara Powell, from Inclusive Minds, who generously gave up her own time to run the training voluntarily. Some 23 people attended the half-day Mental Health First Aid (MHFA) England-approved course, held at the YEP’s offices in Leeds city centre. It offered an introduction into mental health and an insight into its importance in the workplace, for business and charity delegates who attended yesterday. Mrs Powell said: “It was brilliant to partner with the YEP for this course. We had a really diverse and very engaging group. “There were lots of shared experiences around mental health, positive feedback and people wanting to progress with their knowledge and education with mental health. Delegates included representatives from the Leeds Rhinos Foundation, Lloyds Banking Group, Leeds Teaching Hospitals NHS Trust, and the Carers Leeds charity. During the four-hour course, Mrs Powell, 47, spoke of mental health’s protective and risk factors, triggers, phobia and stigma. Among those to take part was Ellie Walton, 22, who works in human resources at the Leeds-based Morgans City Living letting agency. Miss Walton said she led a presentation for staff at her office about mental health awareness, and believes there is a need for further education on the subject for businesses. “I know there’s still people who say that they have never heard of it [mental health] or don’t know,” she said. Attendees received a ‘mental health aware’ certificate, and MHFA learning resource pack at the end of the course. MHFA England kindly provided the resource packs free of charge to the YEP for the course. YEP Editor Hannah Thaxter said: “I am delighted that so many people turned out to the free mental health first aid course at our offices. “Whether you are at home or at work, having someone who understands that mental health is just as important as physical health can make all the difference to people. 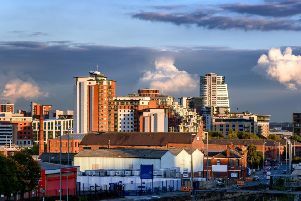 “I have always been passionate about mental health and the provision of support for it, so I am thrilled that we have been able to offer a course like this that could help others in Leeds in the workplace. Mrs Powell is qualified to deliver MHFA’s two-day, one-day and half-day courses - along with bespoke, tailor-made sessions. Since launching her company, Inclusive Minds, she has trained more than 100 people to become mental health first aiders and worked with organisations including The Works, Thrive Law, UK General Insurance, Lhasa and LeedsBID.